I didn’t know that I would finish the trail so early; it’s still high summer; I’ve been gifted this incredible amount of time. I’ve managed to walk so far so quickly and now here I am, sleeping on the floor of my friend’s beautiful house in Portland, the white noise of a fan blowing and outside the blackberries ripening, pears falling all over the sidewalk. I’m poor but I’m rich in almost everything else- there are pears, apples, plums, and figs on the warm August sidewalks, tomatoes crowding the edges of yards. The light is long, and warm, and still; August here is the most reliable summer month, some might say the best month. How the city tries to seduce me! I can walk anywhere, I can walk forever. McButter is here, for a moment, I haven’t seen him since the desert! We walk for hours, to a taco cart that I can’t remember the location of and then, in the dark, to the bluffs, via a serious of quiet dead ends that lead into each other. We pick fruit up off the ground, take bites of it, and throw it away. We make up a rule that whatever clothing we find on the ground we have to wear. We find a hat with a veil and one with a bow, a shrunken wool sweater, and a tiny cotton hoody. We put these things on. McButter tells me that since the desert he’s been hiking mostly solo. He’s been leapfrogging with this group of that, having a transformative personal journey of sorts. He’s also a little bit bored. He’s got just Washington left. At the bluffs we see the shapes of young people silhouetted against the lights of the city, the shining Willamette and across from it the long dark stretch of forest park. The clanging of industry, the UP yard with its units working back and forth. There’s the tree that I like to climb, that I’ve climbed over so many years. I know where the worn handholds are. I’ve sat in its branches with lovers, awkwardly sharing windfall apples. It’s dark now, though. I don’t climb it. Part of me is jealous that McButter is still on the trail; part of me still feels glad to be done. I’m still not wrecked like I was last year but I miss the simple challenges and rewards of the trail, the straightforward structure of each hiking day. I seem to have forgotten how to organize my life; I require large amounts of caffeine in order to muster the creative momentum to turn the wheel of each sprawling day. I know that a life of routine is the most efficient life; right now, instead of routine, I have ten thousand self-starting moments that each require their own small spark of inspiration and occasionally, when biking back from some errand on the beautiful bicycle that Seamus lent me, I just want to give up. I feel darkness tugging at me, a great sea that I could swim in, that riptide of existential despair that waits for us all. But no! I won’t do that! I am too grown up for that. And so I don’t- I drive my wheel forward down its muddy, pathless route and stop every five minutes to hack the brambles away. I’ve been reading the CDT blogs. The CDT sounds awful. I am so excited. Spark and I have been messaging our wild, convoluted ideas to one other. Everything about the hiking world is inspiring to me, and I still don’t really know why- so much walking. I guess part of it is a newfound belief in the capabilities of my own body- I’ve never in my life been much of a jock. But we’ve all given a body, it turns out. And that body can take almost anything. “I want women to understand that they’re stronger than they know,” says Orbit. I met Orbit in passing on the trail last year, tried to catch her, realized how fast she was, failed, and in turn was infinitely inspired. One of the fastest people on the trail, and she is a woman! Of course this happens all the time, but I didn’t know that at the start of my first-ever thru-hike. Now, as of a few weeks ago, Orbit lives in Portland, and she meets me for breakfast at Sweedeedees, a crowded, hip little cafe where small amounts of breakfast food are served with massive slices of house-baked bread. There aren’t any tables free, and the method in which to get a table is confusing- the two beautiful, overwhelmed servers give me conflicting instructions on what order in which to do things and I end of feeling like I’m in an episode of Portlandia. We finally get a rickety little metal table outside, half in and half out of the shade, and our food. I don’t eat bread so my bowl of nothing is underwhelming but Orbit’s breakfast sandwich looks amazing. Afterwards we buy dark chocolate, kombucha and dried mango, respectively, from the little shop across the street and walk, again, to the bluffs- it is my favorite place right now and I want to go there over and over, until I am gone/until the summer is worn out. While walking we talk about hiking, and hiking, and hiking, and the inherently competitive nature of fast hikers/whether or not we are ourselves competitive/what it means to be a woman who wants to hike fast. In the evening my friend Hannah appears, from the bay area, and Seamus and Liam and Hannah and I play spades on the long wooden table in the beautiful dining room. I don’t know how to play spades. We talk about gentrification and the ways that, without connection to others, our own identities would be lost. We’re just a bunch of mirrors, reflecting and reflecting and reflecting. Without each other, do we even exist? What even am you/I/me? This week! I am having a great adventure. I’m going to hike south from White Pass to Cascade Locks with Orbit and another hiker, Redbeard, from last year. Backwards through goat rocks, among all the northbounders who may or may not make it before the snow (HURRY! distance = rate x time! ), down to the Columbia. 150 miles in 5 days. I’m curious to see how my body feels after two weeks off the trail, I’m curious to see how my heart feels. I’m curious to encounter northbound hikers that I never got a chance to meet! (Don’t be rude to me, motherfuckers! 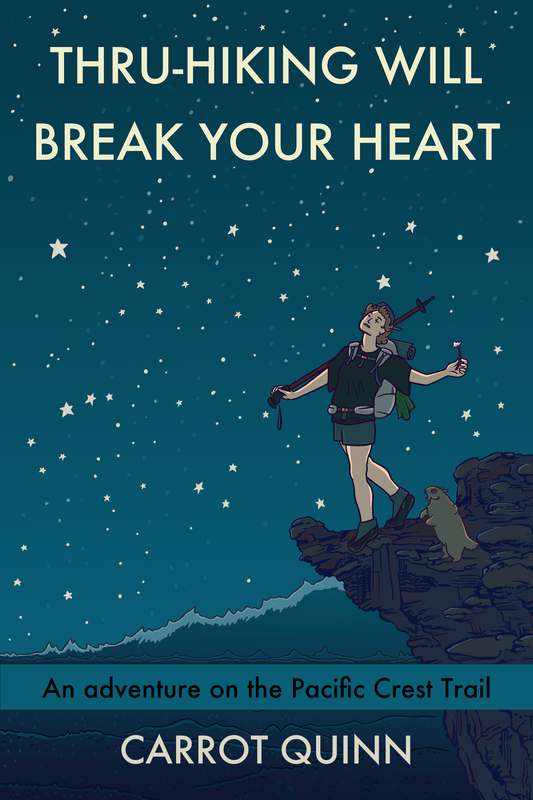 Just because you hiked farther than Cheryl Strayed doesn’t mean you’re going to make it before the snow.) I’ll be posting photos to instagram as I go, and I’ll do a little trip report afterward. Then I head down to Southern Oregon to work. Portland you’ve been so beautiful, but I know that that’s the way the summer goes. Summer is when everyone forgets about the winter. The damp grey skies, the salad mister rain. The mornings so dark you have to turn all the lights on when you wake up. The way everyone struggles. Being here now makes me almost want to live in Portland again, but I know too that this is not the frumpy, disheveled city that I came of age in. This new city is full of beautiful, monied yuppies, who work tech jobs and spend their evenings “trying new restaurants”. Maybe, one day, when I’ve made my fortune, I’ll come back, and buy expensive products for my hair. Until then I’ll live in exile in the hinterlands, with all the other people who look like they got dressed in the dark. In other news! Last night I learned, via his instagram, that Handy Andy, who our group had the great fortune to hike with for a few days this year (he and his friend PigPen were hiking the trail in 90 days) just set the new self-supported speed record for the JMT! 3 days 11 hours, with a backpack that he made himself. So many badasses, so much inspiration! All of it feeds me, makes me think about what’s possible, makes this bushwhacking with my big wooden wheel seem a little easier. My photos, per usual, are on instagram. ← I made an index of my 2014 posts for you! Oh please keep posting, this one made me laugh and laugh … !!! Have a great 5-day trip, Carrot! That is some good writing. Certain phrases tasted like dark chocolate; rich, smooth and satisfying. Thank you for your blog. It brings me so much joy. I am a 63 year old woman who wishes like hell I had lived a life like the one you are living, Love you and can hardly wait for your book. Now that your PCT 2014 thru-hike is completed, I will go back and finish reading your PCT 2013 that I started earlier this year. Also, thank you for all the extra effort you put into the blog to give those of us who are hiking vicariously with you a clearer understanding of the experience. Hugs. Carrot it great to read your post-hike thoughts. Thought I might have the good fortune to run into you as I live near where you’ve been hanging out but no such luck. Darn! Have a great mini-hike and I look forward to the next blog post! Thanks for that beautiful post, Carrot. I so wish you well. Many happy trails to you. Thank you. It’s almost like you know my convoluted thoughts better than I do. I feel this so much. You can drop some lines that, coming from anyone else, would not hold water (I think of “life is a series of switchbacks”), but taken in the context of your blend of humor and profundity and ease, hits me right in the chest. I’m excited to one day buy a real physical book with your name on it (being a luddite I can’t do the e-book thing) so I can carry this stuff around with me. p.s. y’all finished the trail on my 31st birthday. No biggie but I thought that was cool. Taught writing for 33 years, at university level. Not sure I ever read a better writer than you! Keep going on the book ideas. And thank you for the gear-evaluation. When will your SOBO start and are you planning on PCT days at Cascade Locks this weekend? inferior towards the outdoor ones. This can be a television antenna that can be set up in the indoor setting or an outside setting. to to build a Wi-Fi antenna which will enhance up your Net speed. HD content over the air, you need a special antenna. Whether it is inside your house or outside, you might be assured of a clear reception, especially with HDTV signals. stations in hd for free using their digital televisions. No doubt regarding it, the outside receives better signals as opposed to antennas inside. this process outperforms a lot of larger antennas.